EA wanted the hype for Mass Effect 3 to go where no game had gone before. So they flew ten copies of the upcoming game into the stratosphere by attaching them to weather balloons. The idea was to have frenzied fans track down the games and claim them when they descended back to terra firma. In one instance, things aren't going as planned. 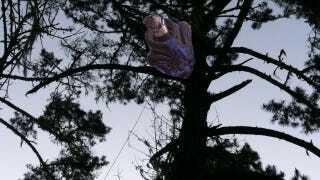 To the dismay of about 10 people ready to jump into the fight against the Reapers, one of the high-altitude copies of Mass Effect 3 came to rest in the upper branches of a very tall tree in the San Francisco area. According to the Mass Effect Facebook page, efforts are being made to dislodge the game from branches that are about 150 ft. in the air. Baseballs have been flung and a slingshot is reportedly standing at the ready. Apparently, no one's Push biotics are strong enough to shove the threequel out from such heights. Here's hoping the other nine copies—and the people chasing them—have better luck.